Today, we recognize and celebrate our 2018 ACT College and Career Readiness Champions! 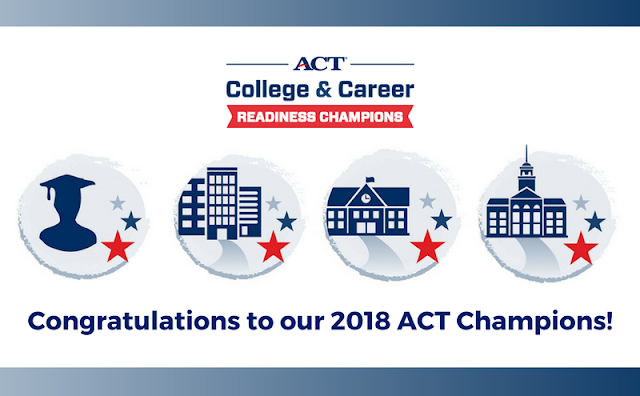 The ACT College and Career Readiness Champions are individuals across the country who support ACT’s mission of education and workplace success. They are high school seniors, K-12, postsecondary, and workforce professionals, who have demonstrated exemplary behavior and contributions in support of college and career readiness in their respective communities. Check out the Champion criteria here, and learn more below from our five District Managers who support ACT State Organizations for the U.S. Check out our Twitter thread to join the conversation and take a look at the names of this year's Champions below. Help us spread the word by sharing these stories in your communities. Check out the media kits for each champion category below to help tell the story of the amazing work being done in your state.